Today we'll talk about another fashion brand linked to the Jack Russell Terrier. In this case of bags and suitcases. It is the French firm Jack Russell Malletier. It is such an unique firm, you can even rent one of their purses or bags from 25 € / day. We are trying to figure out what is the reason to take the "Jack Russell" as part of the name, because apart of the logo in the history of the brand there is no indication of reference to the breed. We will continue investigating ... If anyone knows, please tell us by leaving a comment HERE. 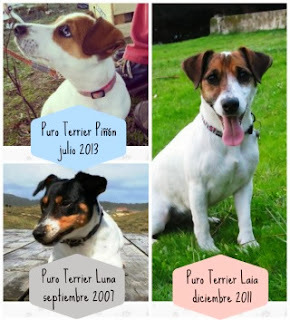 Hoy hablaremos de otra marca de moda vinculada a los Jack Russell Terrier. En este caso de bolsos y maletas. Se trata de la firma francesa Jack Russell Malletier. Se trata de una firma tan exclusiva, que incluso puede alquilarse uno de sus bolsos o maletas desde 25 €/día. Estamos tratando de averiguar cuál es el motivo de llevar el "Jack Russell" como parte del nombre, ya que aparte del logotipo, en la historia de la marca no hay ningún indicio de relación con la raza. Seguiremos investigando... Si alguien lo sabe, por favor que nos lo cuente dejando un comentario AQUÍ.